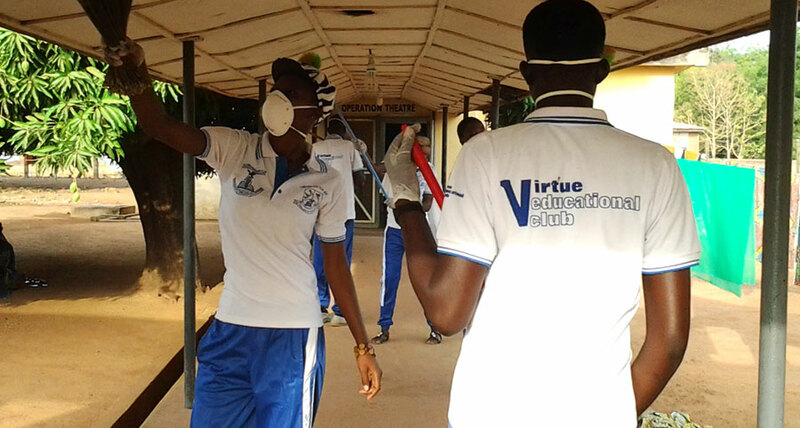 As part of the activities to mark the celebration of ‘Paari Gbeile Festival’ in Tumu in March 2014, students of Virtue Educational Club of Tumu Senior High Technical School took part in a cleanup campaign at several major public facilities and grounds in Tumu to help clean up their community. In addition to promoting volunteerism, this activity helped to share the importance of cleanliness and healthy lifestyles amongst community members. The cleanup campaign was carried out over three days, and encompassed such activities such as drainage de-silting, mowing of grass, weeding, sweeping, picking of litter/ plastic bags, donation of dust bins, and painting in public grounds. The students also volunteered to clean the Tumu District Hospital, in addition to their school, Tumu Senior Technical High School. The students lead by example with the aim of involving their peers in the spirit of volunteerism and sense of responsibility. Nearly 100 students ultimately joined this event, including teachers and patrons of the Virtue Educational Club.